Moist. Prairies, railroads, roadsides, disturbed areas. 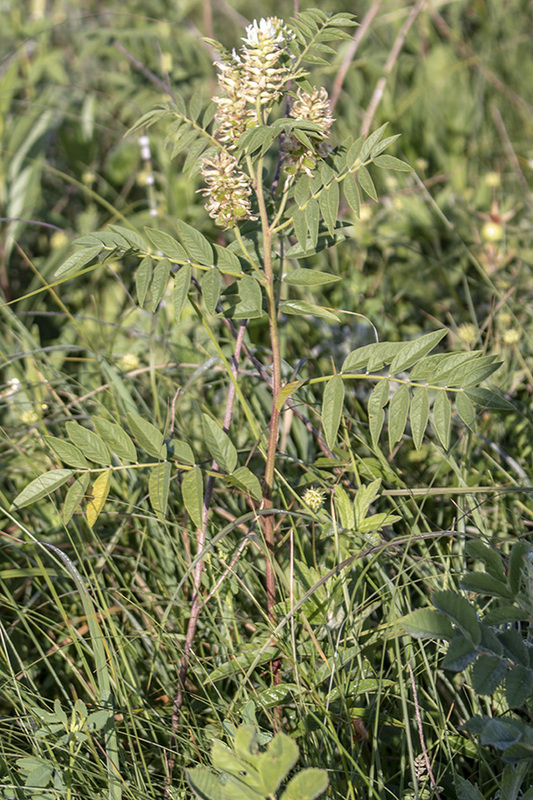 This is a 18″ to 36″ tall, though usually closer to 18″ tall, erect, perennial forb that rises on 1 to several stems from extensive, deep, aromatic, woody, sweetish rhizomes. It often forms colonies. 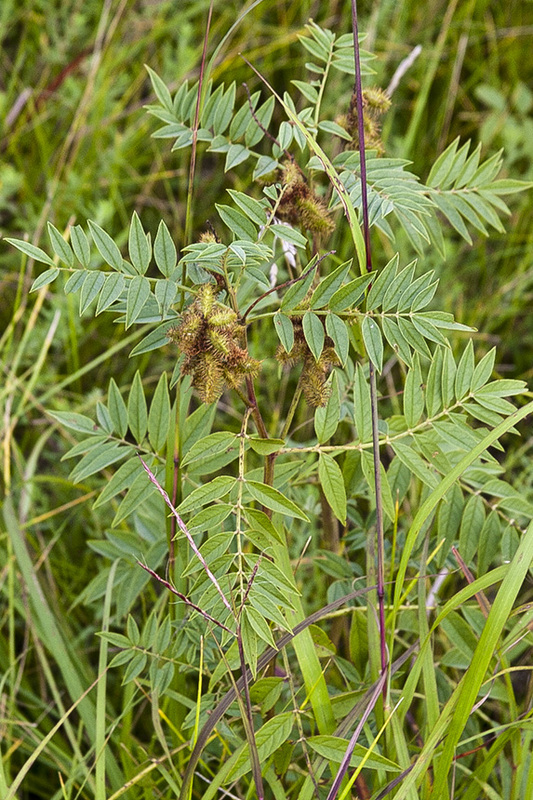 The stems are hairless and branched. They are covered with unstalked glands, which are like minute, sticky hairs. 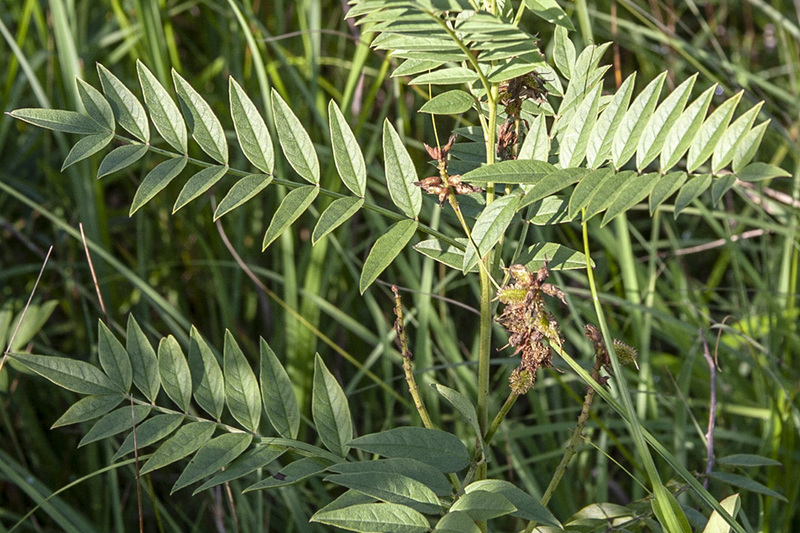 The leaves are alternate and up to 8″ long. They are pinnately divided into an odd number of leaflets, possibly 7 to 21, but usually 11 to 19. When young the leaflets have small scales on their surface, which soon change to sticky, resinous dots (glands). They are arranged oppositely along the leaf stem, with a single leaflet terminating the stem. 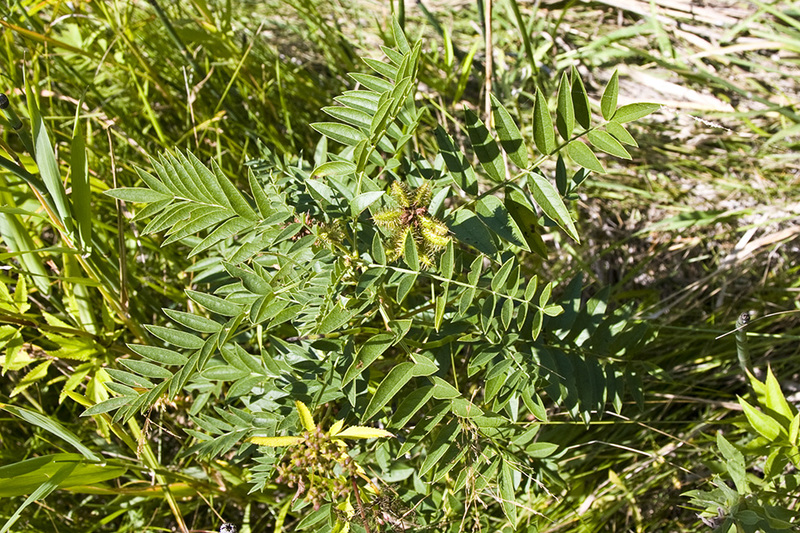 The leaflets are untoothed, lanceolate to oblong, ¾″ to 1½″ long, and 1½ to 2½ times as long as wide. They narrow to an abruptly-pointed tip. The upper surface is green and hairless. On the underside of the leaflets the midvein may be covered with hairs. There is a pair of small, linear, leaf-like appendages (stipules) at the base of each leaf stalk, but they fall off as the plant matures. The inflorescence is a dense, conical-shaped cluster of about 10 to 20, 1″ to 2″ long flowers, rising from the middle and upper leaf axils. 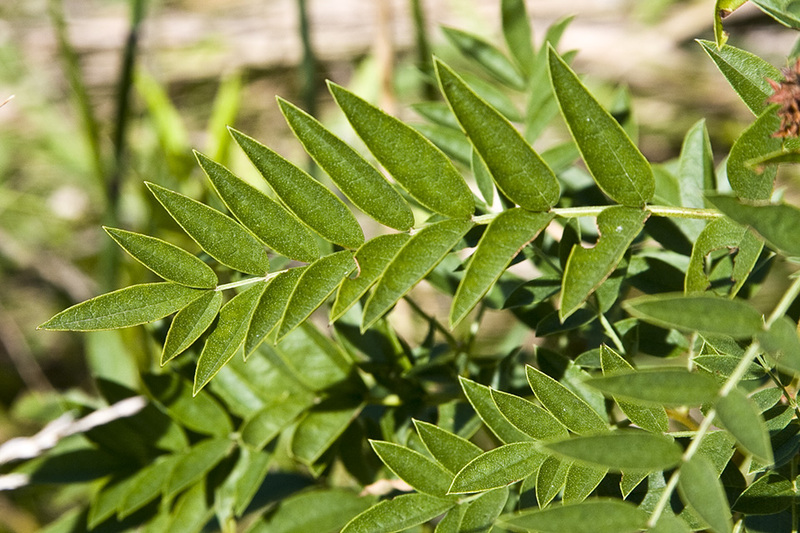 The clusters are shorter than the compound leaf subtending the cluster. The flowers are about ½″ long and have 5 petals. 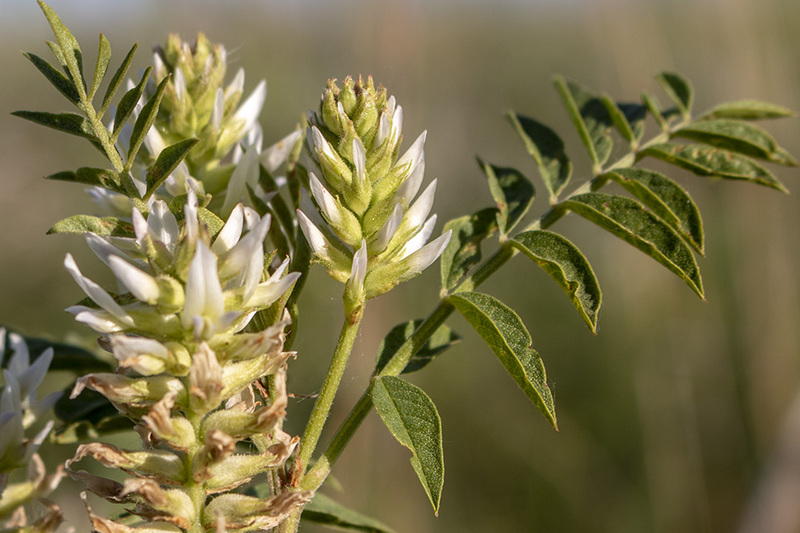 The petals are yellowish-white to greenish-white, and are arranged similar to alfalfa flowers, with banner, wings, and keel. The banner is only slightly bent backward from the wings. The wings are narrow. The keel comes to a sharp point. 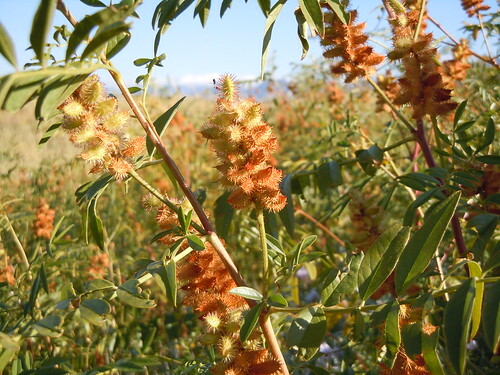 The fruits are brown, ½″ to 1″ long, leathery pods containing 2 to 5 seeds. 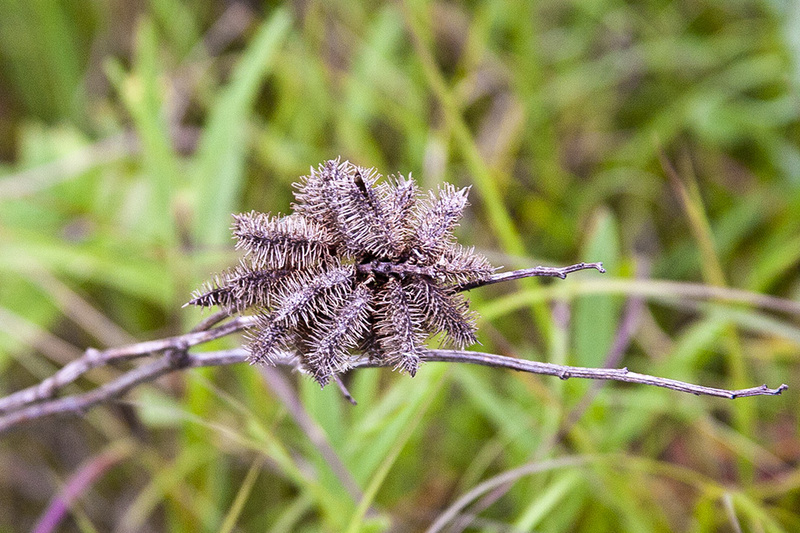 They are covered with many hooked, brown bristles, resembling a cocklebur. 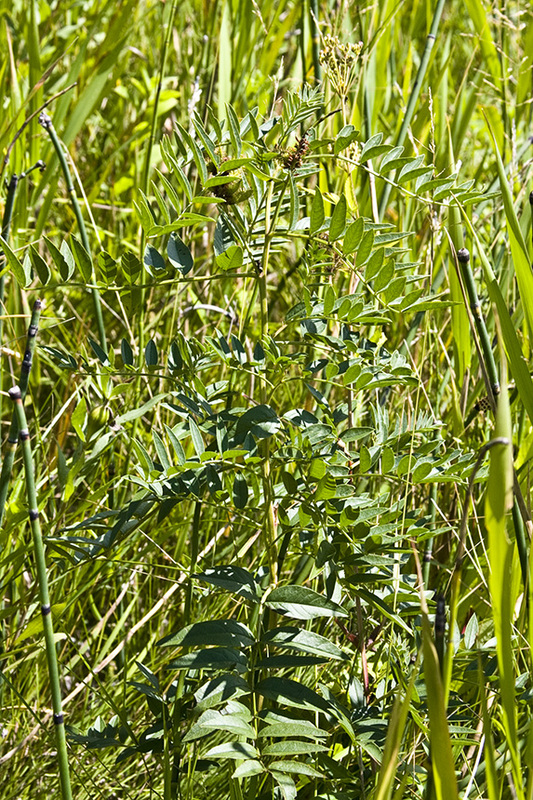 Canadian milkvetch (Astragalus canadensis var. 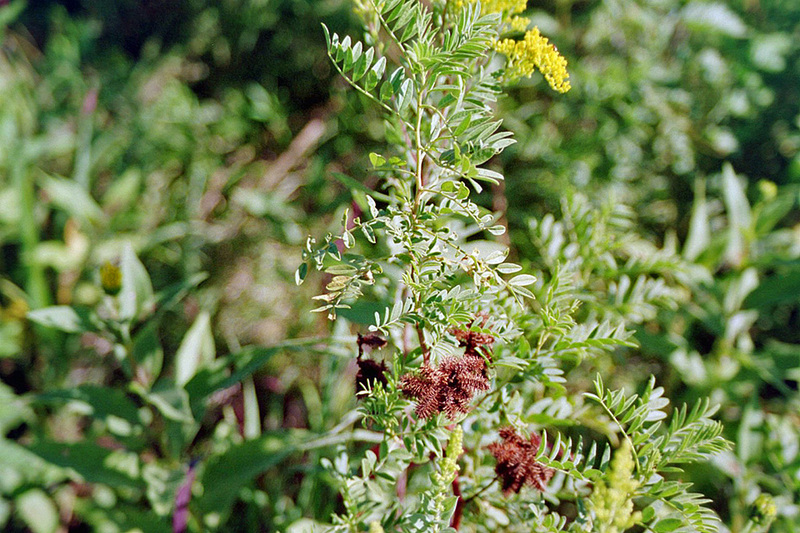 canadensis) is a taller plant, 12″ to 48″ tall at maturity. It does not have sticky glands, neither on the stem nor on the leaves. The leaflets are rounded or notched at the tip, not sharply pointed. The flowering spike is much longer, 7″ to 11″ long, is 1″ or 2″ longer than the compound leaf subtending it, and has about 75 flowers. The flowers are greenish-yellow to cream-colored. Two to four times longer than wide with nearly parallel sides. A small leaf-like appendage at the base of a leafstalk. Native perennial rhizomatous herb, stems sometimes over 1 m tall bearing few if any branches, herbage glandular punctate, pods densely bristly, each bristles with a hooked tip, open settings near streams and seep areas, gravel bars, moist meadows.